The river valley’s fertility, augmented by the monsoon rains, made farming and herding a mainstay of the civilization’s economy, which was also supplemented by internal and external trade. Among the key characteristics of the Indus civilization sites, which have now been found over a vast swath of Pakistan and northwestern India, is their uniformity. The cities were constructed with standardized size bricks and feature a rectilinear street plan, granaries, drainage and sewage systems, and multi-story homes. The civilization also developed a uniform system of weights and measures as well as a form of writing, which has yet to be decoded. In number and extent, the Indus civilization was the largest of the civilizations in the ancient world. Although the reasons for the Indus civilization’s decline are not absolutely known, mounting geological evidence suggests that climate change may have been a factor. 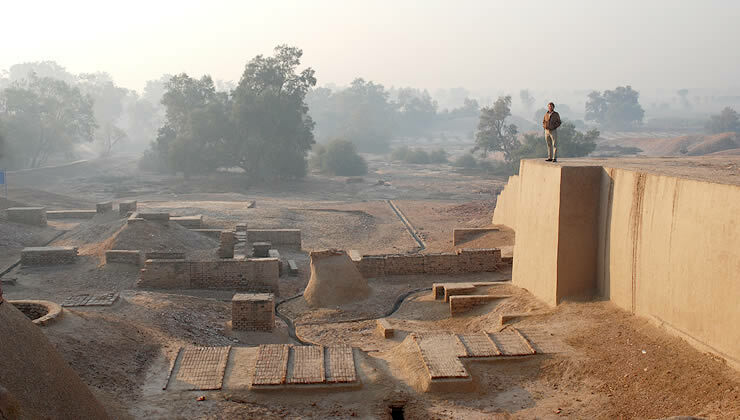 Harappa was an ancient urban settlement of the Bronze Age, located near the former course of the Ravi River, in northeast Pakistan, uncovered in the 1920s. Harappa and Mohenjo-daro, a similarly-planned city situated further south, near the banks of the Indus River, are considered part of the same vast civilization, the Indus Valley Civilization, which thrived from 2600 to 1900 BCE. Remnants of Harappa's citadel wall, made of mud brick, are still visible, even though many of its bricks were plundered during the construction of a railway in the 19th century. Archaeological excavations indicate that the city's granaries were situated north of the citadel, while a cemetery was located to its south. Similar to the other cities of the Indus Valley Civilization, the streets were laid out in a grid-like pattern, running either north to south or east to west. The settlement's flat-roof homes, of one or two stories, featured indoor plumbing that connected to a highly-developed drainage and waste removal system. Painted pottery, bronze and copper tools, terra cotta figures, and numerous inscribed stamped seals, decorated with animal motifs, are among the artifacts that have been unearthed at Harappa and Mohenjo-daro. Even with these finds, the identities of the cities' rulers remain in doubt. India's climate is particularly affected by monsoons, strong winds that change direction with the seasons due to differences in land and ocean temperature and can trigger dramatic changes in weather. Derived from the Arabic for season (mausim), monsoons in India blow from the sea toward land in a southwest direction from June to September. From October through December, winds blow over land toward the sea from a northeast direction, sweeping from the Himalayas to the Indian Ocean. The rains during the summer or "wet" monsoon come down when air that has absorbed heat from the Indian landmass rises and is replaced by cooler air from over the Indian Ocean. Since temperatures during India's summer can reach over 100 degrees Fahrenheit, the "wet" monsoon brings much-needed relief. The country's agricultural industry and economy rely on the summer monsoon, which supplies as much as 80% of India's rainfall. However, heavy monsoon seasons, which can bring many feet of rain in a matter of months, have led to landslides and have destroyed crops and villages. Conversely, monsoon failure can cause years of drought, and scientists theorize that a weakened monsoon may have contributed to the fall of the Indus Valley Civilization. In the 19th and 20th centuries, archaeologists discovered traces of India's earliest civilization, one that developed in the fertile Indus River Valley between 3000 and 1900 BCE. Larger than either the Egyptian or Mesopotamian civilizations of the same period, the population of the Indus Valley (or Harappan) Civilization is estimated at anywhere between two and five million people. Among the civilization's 2000 major settlements were the planned cities of Harappa and Mohenjo-daro, trading and craft production centers where craftspeople and villages wrought pottery and intricate beads made of gold, copper, and ivory. Archaeological evidence shows that after 700 years of stability, the civilization declined. Most of the Indus settlements had been abandoned or had shrunk in size by about 1800 BCE. Many factors contributed to the end of the Indus civilization, but climate change is emerging as a primary reason for its gradual demise. Geological evidence shows that the region's climate grew colder and drier, in part perhaps because of a weakened monsoon. By 1800 BCE, the Ghaggar-Hakra River, a river in the region that paralleled the Indus system and that some scholars suggest is the Saraswati, the lost sacred river of Rig Veda, was severely diminished. As a result, cities were abandoned and though some of the population remained, many migrated to more fertile lands in the east around the Ganges and Jumna River. What have archaeologists found at Harappa and Mohenjo-Daro that indicate that the cities were part of an advanced civilization? 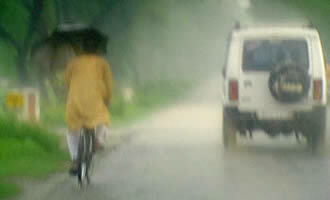 While the monsoon winds are an essential part of Indian trade and agricultural history, what problems can they cause? 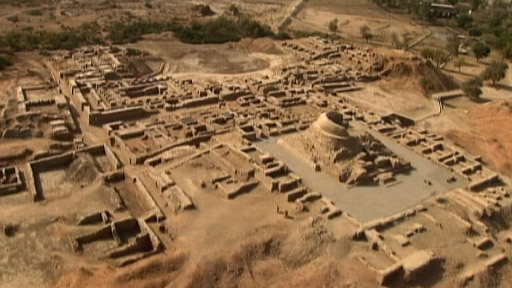 In ancient times, climate change may have caused Indus Valley cities to have been abandoned. What changes to civilizations and cities might modern climate change bring?